Lithuanians working in Norway are no news. Because of high wages for even unqualified jobs, this country has been a prime destination for Lithuanian emigration for some time now. 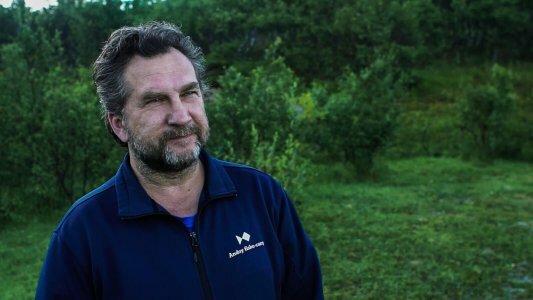 In Northern Norway, beyond the Arctic Circle, expedition “Baltoscandia 2016” participants met fellow Lithuanians who have been for the last five years developing successful business, rather than simply making ends meet. “As through all trek across the world “Mission Lithuania 100”, while traveling we’re seeking Lithuanian traces. Science, politics, culture and business achievements are important for our self-worth and understanding that small nations can also achieve their goals. While traveling in Norway we wanted to refute the myth that emigrants are necessarily menial labourers, piling up riches for the locals. We’ve spent three nights in the ‘Andoy fiske-camp’, so we had time to learn how Lithuanians are making a successful business in the rich Norway” said expedition member Aistė Simėnaitė. 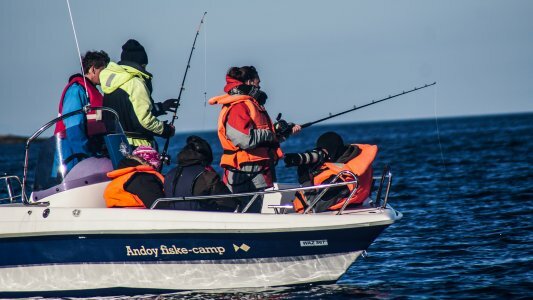 On the island of Andøya, by the village of Andenes, in a former NATO military base, a Lithuanian-founded recreational fishing base is located, which is running for its fifth season. “Of course, starting such as business in Lithuania is difficult due to natural conditions. 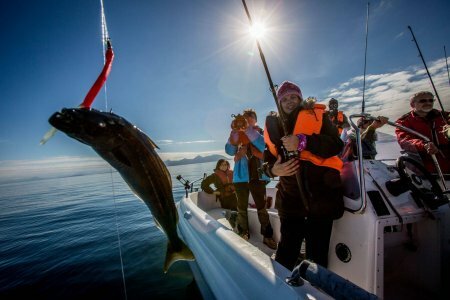 On the other hand, here fishermen who come from all over the world can expect catches weighing tens and even a hundred kilos, as well as to see whales, orcas, various birds, and to observe the midnight sun or the aurora borealis. However, about half of our clients are Lithuanians, the rest are guests from Japan, New Zealand, USA and other countries.” – Saulius Babravičius, CEO of the company, tells us. All the people working here claim that they haven’t abandoned Lithuania. “We still live at home for half a year, during the off-season. We joke that we’re on long-term leave. The views outside the window and on the open sea here are spectacular, but nothing can replace you homeland.” says captain Tomas. It’s under his supervision that the expedition members leave for the sea. “We can’t forget one of our main goals – to capture the nature and call for its preservation. Over the course of merely few hours we’ve filmed baby whales, rare birds, and beautiful fjords. And we’ve had a chance to partake in the joys of fishing too.” told expedition cameraman Ignas Veršinskas. One of “Baltoscandia 2016” goals is to fully prepare for the three-year trek across the world. “It’s very important to attune yourself to regime that isn’t harmful. Even though the workloads are large we must find time for rest and sleep as well. I am glad that the expedition members had a good experience and rest at the ‘Andoy fiske-camp’. Lack of rest and sleep rhythm can lead to serious health issues.” said trek participant Ieva Kieraitė-Aleksandrova, who is responsible for participants’ health. The trek crew will be crossing the Bering Strait by attaching pontoons to the vehicles. So far 4 expeditions have successfully made it to the strait in winter, one has crossed the Bering Strait, but none have succeeded in crossing Alaska and reaching civilization in summer time. This stage involves 4500 km of complete off-road. It is the most complicated and also the most interesting part of the coming trek. If we successfully do this, we will be the first in the world. Photos by Vidmantas Balkūnas and Ignas Veršinskas.